Antonio Maria Valsalva (1666-1723) was an Italian anatomist, physician and surgeon whose name is familiar to cardiologists for two reasons. First, he described what are now termed the sinuses of Valsalva, the three areas of dilatation in the proximal portion of the aorta just outside the opening of the aortic valve. Second, in his textbook on the ear, De aure humana tractatus, published in 1704 in Bologna, he showed an original method of inflating the middle ear (now called Valsalva’s manoeuvre) in order to expel pus. A variation of this classic Valsalva maneuver is used frequently in cardiology for diagnostic and therapeutic purposes. The skeptical cardiologist and his newly-minted bride, will be jetting off to Italy in a few weeks but, alas, we are not visiting Bologna. Hopefully we won’t need to utilize the original Valsalva manouevre to equalize the pressure between our middle ears and the cabin atmosphere in order to prevent otic barotrauma as we descend. 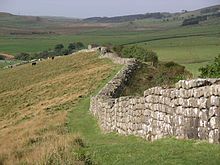 I don’t feel so bad about the rock because the wikipedia caption reads as follows:Sections of Hadrian’s Wall remain along the route, though much has been dismantled over the years to use the stones for various nearby construction projects. I’ve been fascinated by the Roman Empire since I took Latin in high school. I was so obsessed with all things Roman that when my family traveled back to England to visit relatives and such, I insisted on us visiting Hadrian’s Wall. Don’t tell the authorities, but I still possess a rock I took from said wall. The only time I’ve been to Italy was 30 years ago after presenting at the European Society of Cardiology meeting in Nice, France. I foolishly rented a car and drove north to Lago Maggiore. It was one of the most harrowing experiences of my life. This time we are flying into Rome and then taking a train to Florence. From Florence I’m planning to rent a car (having failed to learn my lesson) to drive to La Foce, an historic estate, which lies on the hills overlooking the Val d’Orcia. Midway between Florence and Rome, it is also within easy reach of Siena, Arezzo, Perugia, Assisi, Orvieto. Renaissance and medieval gems such as Pienza, Montepulciano, Monticchiello and Montalcino are only a few miles away. The countryside abounds in lovely walks among woods and the characteristic crete senesi (clay hills); the food is among the best in Tuscany and famous wines such as the Vino Nobile and Brunello can be tasted in the local cellars. The Val d’Orcia has recently been included among the World Heritage sites of UNESCO. From the heart of Tuscany, we then drive to the coast of northern Tuscany to meet up with the in-laws in Viareggio. After a few nights in Viareggio with Geo (the man on the statin fence) and Wendy, we will all take a ferry to the Cinque Terra, staying in Manarola. Lastly, we will travel to Milan, and then fly home. I’ve got a good idea of what the top tourist destinations are in these cities from reading Rick Steves’ book on Italy and from discussions with friends who have been there. However, we typically prefer wandering semi-aimlessly in great cities, rather than dealing with large tourist herds at the must-see attractions. spans 34 rooms and contains not only zoological subjects, such as a stuffed hippopotamus(a 17th-century Medici pet, which once lived in the Boboli Gardens), but also a collection of anatomical waxes (including those by Gaetano Giulio Zumbo and Clemente Susini), an art developed in Florence in the 17th century for the purpose of teaching medicine. This collection is very famous worldwide for the incredible accuracy and realism of the details, copied from real corpses. Also in La Specola on display are scientific and medical instruments. Parts of the museum are decorated with frescoes and pietra dura representing some of the principal Italian scientific achievements from the Renaissance to the late 18th century. I tend to rely on Rick Steves’ books for European travel, but if any readers have experience in these Italian areas please feel free to add them to the comments section or send me an email at dr._pearson@icloud.com. I would be especially interested in “off-the-beaten path” things of interest (especially if they have a literary, medical or scientific connection) and restaurant recommendations. To all my patients, please accept my apologies for any rescheduling this may have caused. In my absence you will be in good hands as my partners, primarily Brian Kaebnick, will be covering for me. The skeptical cardiologist has always had a fondness for push-ups. Therefore I read with interest a recent study published in JAMAOpen which looked at how many push-ups a group of 30 and 40-something male firefighters from Indiana could do and how that related to cardiovascular outcomes over the next ten years. The article was published in the peer-reviewed journal JAMA Network Open, and is freely available to access online. Both the Metro and the Daily Mirror highlighted the result of 40 push-ups being “the magic number” for preventing heart disease, but in fact being able to do 10 or more push-ups was also associated with lower heart disease risk. The study involved 1,104 male firefighters (average age 39.6) from 10 fire departments in Indiana who underwent regular medical checks between 2000 and 2010. At baseline the participants underwent a physical fitness assessment which included push-up capacity (hereafter referred to as the push-up number (PUN))and treadmill exercise tolerance tests conducted per standardized protocols. For push-ups, the firefighter was instructed to begin push-ups in time with a metronome set at 80 beats per minute. Clinic staff counted the number of push-ups completed until the participant reached 80, missed 3 or more beats of the metronome, or stopped owing to exhaustion or other symptoms (dizziness, lightheadedness, chest pain, or shortness of breath). Numbers of push-ups were arbitrarily divided into 5 categories in increments of 10 push-ups for each category. Exercise tolerance tests were performed on a treadmill using a modified Bruce protocol until participants reached at least 85% of their maximal predicted heart rates, requested early termination, or experienced a clinical indication for early termination according to the American College of Sports Medicine Guidelines (maximum oxygen consumption [V̇ O2max]). The main outcomes assessed were new diagnoses of heart disease from enrollment up to 2010. Here’s the graph of the probability of being free of a CVD event on the y-axis with time on x-axis. The black line represents those 75 firefighters who couldn’t make it into double digits, the green those 155 who did more than 40 pushups. Participants able to complete more than 40 push-ups had a significant 96% lower rate of CVD events compared with those completing fewer than 10 push-ups. It is surprising that the push up number seemed a better predictor of outcomes than the exercise test, This should be taken with a grain of salt because although the investigators report out “VO2 max” the stress tests were not maximal tests. The firefighters with lower push up numbers were fatter, more likely to smoke and had higher blood pressure, glucose and cholesterol levels. What useful information can one take from this study? You definitely cannot say that being able to do more than 40 pushups will somehow prevent heart disease. The PUN is neither causing nor preventing anything. The PUN is a marker for the overall physical shape of these firefighters. It’s a marker for how these men were taking care of themselves. If you are a 39 year old fireman from Indiana and can’t do 11 push-ups you are in very sorry condition and it is likely evident in numerous other ways. The <11 PUN crew were a bunch of fat, diabetic, insulin resistant, hyperlipidemic, out-of-shape hypertensives who were heart attacks in the waiting. Despite the meaningless of this study you should consider adding push-ups to your exercise routine. Doing them won’t save your life but it will contribute to mitigating the weakness and frailty of aging. Don’t obsess about your PUN. I’ve always liked push-ups and highly recommend them. They require no special equipment or preparation. It’s a quick exercise that builds upper body muscle strength, adds to my core strength and gets my heart rate up a bit. For some reason my office in O’Fallon is always cold so several times during the day when I’m there I’ll do 100 jumping jacks and drop on the carpet and do some push-ups in an effort to get warm. I don’t do them every day but the last time I tried I could do 50 in less than a minute and that has me convinced I will live forever! I’ve spent a lot of time on this blog emphasizing the importance of aerobic exercise for cardiovascular health but I also am a believer in strength and flexibility training for overall health and longevity. As we age we suffer more and more from sarcopenia-a gradual decrease in muscle mass. Push-ups are a great resistance exercise. For a description of the perfect form for a push up see here. The ACC meetings in New Orleans have wrapped up and I must stop letting the good times roll. 1. After the historic back to back presentations of the Partner 3 and Evolut trials it is clear that catheter-based aortic valve replacement (TAVR) should be the preferred approach to most patients with severe symptomatic aortic stenosis. Both TAVR valves (the baloon-expanded Edwards and the self-expanding Medtronic) proved superior to surgical AVR in terms of one year clinical outcomes. 2. The Alcohol-AF Trial. It is well known that binge alcohol consumption (holiday heart) can trigger atrial fibrillation (AF) and that observational studies show a higher incident of AF with higher amounts of alcohol consumption. This trial was the first ever randomized controlled trial of alcohol abstinence in moderate drinkers with paroxysmal AF (minimum 2 episodes in the last 6 months) or persistent AF requiring cardioversion. Participants consumed >/= 10 standard drinks per week and were randomized to abstinence or usual consumption. They underwent comprehensive rhythm monitoring with implantable loop recorders or existing pacemakers and twice daily AliveCor monitoring for 6 months. Those in the abstinence arm also experienced improved symptom severity, weight loss and BP control. This trial gives me precise numbers to present to my AF patients to show them how important eliminating alcohol consumption is if they want to have less AF episodes. It further emphasizes the point that lifestyle changes (including weight loss, exercise and stress-reduction) can dramatically reduce the incidence of atrial fibrillation. Apixaban (Eliquis, one of the four newer oral anticoagulants (NOAC)) versus warfarin for patients with AF: which is safer for prevention of stroke related to AF? Triple therapy with low dose aspirin and clopidogrel plus warfarin/NOAC versus clopidogrel plus warfarin/NOAC: which is safer in preventing stent thrombosis without causing excess bleeding in patients with AF and recent stent? The NOAC apixaban patients compared to warfarin had a 31% reduction in bleeding and hospitalization. No difference in ischemic events. This means that the dreaded “triple therapy” after PCI in patients with AF with its huge bleeding risks no longer is needed. It also further emphasizes that NOACs should be preferred over warfarin in most patients with AF. The combination of choice now should be a NOAC like apixaban plus clopidogrel. 4. REDUCE-IT provided further evidence that icosapent ethyl (Vascepa) significantly reduces major cardiovascular events in patients with establshed CV disease on maximally tolerated statin therapy. The results of the pirmary end point from the REDUCE-IT were presented at the AHA meeting last year and they were very persuasive. At the ACC, Deepak Bhatt presented data on reduction of total ischemic events from the study and they were equally impressive. Adding the pharmaceutical grade esterified form of EPA at 2 grams BID reduced first, second, third and fourth ischemic events in this high risk population. The benefit was noted on all terciles of baseline triglyceride levels. Thus, the lowest tercile of 81 to 190 mg/dl benefitted as well as the highest tercile (250 to 1401). Although I dread the costs, it’s time to start discussing adding Vascepa on to statin therapy in high risk ASCVD patients who have trigs>100 . As I wrote previously I didn’t learn anything from the much ballyhooed and highly anticipated Apple Heart Study . It’s entirely possible more participants were harmed than helped by this study. These studies suggest to me for the first time that TAVR may ultimately replace SAVR for all patients with severe aortic stenosis, low to high in their risk for surgery. Clearly, we need ongoing follow up of these patients and more long term data, but as these devices improve and the operators gain more experience it is likely that results will only get better. This represents a huge paradigm shift in our approach to valvular heart disease. This morning I watched two more amazing study presentations at the ACC meeting in New Orleans which unequivocally establish the minimally invasive TAVR procedure (which my cardiology colleagues perform here at St. Luke’s) as the treatment of choice for patients who have symptoms related to severe narrowing of their aortic valve (aortic stenosis). Since 2015 it’s been clear to me that catheter-based procedures (TAVR) were a better option than open-heart surgical aortic valve replacement for most of my patients with severe symptomatic aortic stenosis who were at high (>8% STS ) and intermediate (>4% STS) risk for surgery. Based on continued durability of TAVR results and outstanding results in my own institution, I’ve been advising my low risk patients with severe aortic stenosis that it was only a matter of time before TAVR would become the best option for them. At the American College of Cardiology Meetings in New Orleans this morning two back to back presentations have confirmed that TAVR should be considered the treatment of choice rather than surgical aortic valve replacement ( SAVR) for most low risk patients with severe symptomatic AS. This is such a dramatic paradigm shift in the treatment of AS that the Eugene Braunwald (now 90 years old) the first discussant of the presentations after reviewing the history of the treatment of AS, described it as an “historic moment” , one that we will tell our grandchildren that we were present at. Furthermore, in a display I’ve never seen at an ACC session, the audience spontaneously stood and gave the presenters a standing ovation. Both studies were published yesterday in the NEJM (something the presenters indicated was an error) and disappointingly I read the results described in a New York Times article prior to watching the live presentation. The first presentation was from Martin Leon on the Partner 3 trial which utilizes the Edwards Sapien 3, third generation baloon-expandable valve. The study randomized 1,000 patients to either TAVR or standard SAVR with a bioprosthetic valve. The primary endpoint was the composite of death from any cause, stroke or re-hospitalization at one year after the procedure. At one year, the primary endpoint occurred in 8.5 percent of the TAVR group compared with 15.1 percent of the surgery group, meeting the requirements for both noninferiority (p<0.001) and superiority of TAVR vs. surgery (p<0.001). The Kaplan-Meir analysis of the primary endpoint components with TAVR vs. surgery found mortality rates of 1.0 percent vs. 2.5 percent, stroke rates of 1.2 percent vs. 3.1 percent, and rehospitalization rates of 7.3 percent vs. 11.0 percent, respectively. The length of hospital stay was reduced from seven to three days with TAVR. At 30 days, TAVR was statistically superior to surgery for the secondary combined endpoint of all-cause mortality or disabling stroke (0.8 vs. 2.6 percent). Patients receiving TAVR had significantly better quality of life and hemodynamics at 30 days. I concur that these studies represent tremendous data that will drive a paradigm shift in the treatment of AS and anticipate that we will rapidly receive approval to use these two TAVR devices in all patients who meet the entry criteria (note that bicuspid AV was an exclusion but a subsequent presentation at ACC19 suggests that outcomes are similar in bicuspid valve patients to tricuspid valve patients). The results of the Apple Heart Study, were presented this morning at the American College of Cardiology Scientific Sessions amid intense media scrutiny. The AHS is a “prospective, single arm pragmatic study” which had the primary objective of measuring the proportion of participants with an irregular pulse detected by the Apple Watch who turn out to have atrial fibrillation on subsequent ambulatory ECG patch monitoring. I and over 400,000 other Apple Watch owners participated in the AH study by downloading the Apple Heart Study app and self-verifying our eligibility. My assessment is that we have learned little to nothing from the AHS that we didn’t already know. I’m also concerned that many patients suffered anxiety or unnecessary testing after being referred to urgent care centers, emergency departments, cardiologists or primary care providers and the results of these inappropriate referrals may never be determined. Participants enrolled by submitting information using the iPhone Heart Study app and none of their isubmitted nformation was verified. Only 945 of the 2161 who received a pulse notification participated in the first study visit. After all these exclusions only 658 ECG monitor patches were shipped to the participants of which only 450 were returned and analyzed. This means of the original 2161 participants who were notified of pulse irregularity, the study only reports data on 450 or 21%. Such a low rate of participation makes any conclusions from the study suspect. Of the 450 ECG patches analyzed only 34% were classified as having afib. Only 25% of this afib lasted longer than 24 hours. After the patch data was analyzed, patients had a second Telehealth visit with Dr. Appleseed who reviewed the findings with the patient. Per the initial published description of the methods of the AHS (see here) Dr. Appleseed would tell the participant to head to the ER if certain abnormalities were found on the ECG. Even more distressing is the call that participants would have received based on “the initial technical read:” I’m presuming this “technical read” was by a technician and not by a cardiologist. In my experience, many initial reads from long term monitors are inaccurate. I wonder how many ERs had AHS participants show up saying they had been told they had a life-threatening arrhythmia? How much down stream testing with possible invasive, life-threatening procedures such as cardiac catheterization were performed in response to these notifications? Overall, these findings add nothing to previous studies using wearable PPG technology and they certainly don’t leave me with any confidence that the Apple Watch is accurately automatically detecting atrial fibrillation. Was more harm than good done by the Apple Heart Study? We will never know. The strength of this study, the large number of easily recruited participants is also its Achilles heel. We don’t know that any information about the participants is correct and we don’t have any validated follow up of the outcomes. In particular, I’m concerned that we don’t know what happened to all of these individuals who were sent to various health care providers thinking there might be something seriously wrong. Perhaps Apple and Stanford need to review the first dictum of medicine: Primum Non Nocere, First Do No Harm. Should All Patients With A High Coronary Calcium Score Undergo Stress Testing? Coronary artery calcium (CAC) scans are an excellent tool for better defining coronary heart disease risk in many individuals. In light of the recent ACC/AHA guidelines endorsement of CAC, the skeptical cardiologist anticipates that primary care physicians will be ordering more and will often be faced with the question of what to do with abnormally high results. There are two, diametrically opposed viewpoints which have been taken on this issue. The majority of cardiologists are likely to fall into the camp of “more testing is good” which was summarized in a State of The Art article that Dr. Harvey Hecht wrote in JACC recently. There is a high yield of abnormal results from stress testing when done on patients with high CAC. The appropriateness of stress testing after CAC scanning in asymptomatic patients is directly related to the CAC score. The incidence of abnormal nuclear stress testing is 1.3%, 11.3%, and 35.2% for CAC scores 400, respectively . Stress MPI testing is more sensitive than stress ECG testing alone but in clinical practice I see a very high rate of false positive stress MPI results. Stress MPI is also much more expensive than stress ECG testing and delivers significant radiation exposure to patients. Thus if stress MPI is performed on all individuals with CAC>400 we are likely to generate lots of abnormal tests followed by lots of unnecessary down-stream testing. The cynic in me has to point out that the average CAC score for white males of 67 years is 98 and that of 68 years is 115. Thus, this algorithm has the potential to recommend stress testing be performed on half of all white males with no symptoms over the age of 67. The costs of this approach would be astronomical. This guideline supports stress ECG, stress MPI and stress echo as appropriate. Stress MPI is considerably more expensive than stress ECG and carries substantial radiation burden. Stress echo in my experience, if performed and read properly has the lowest incidence of false positives and is more appropriate therefore for screening asymptomatic individuals. It’s also important to point out that these appropriate usage criteria, with rare exceptions are based primarily on the expert opinion of the stakeholders who stand to benefit from the additional testing. The unspoken third leg of the argument for stress testing is that once an abnormal stress test is found and the patient is noted to be in a higher risk category for events, therapy will be changed and this therapeutic intervention will improve outcomes. This therapeutic intervention could be more intense management of risk factors for CAD but in most cardiologist’s and patient’s minds the next step is coronary angiography with the potential to stent blocked coronaries or to perform coronary bypass surgery. Asymptomatic individuals with diabetes are recognized as intrinsically higher risk for cardiac events and commonly do not experience symptoms even with advanced CAD. Thus, they are often the focus of more intense screening recommendations. In 2017, The Imaging Council of the American College of Cardiology published their review of evidence regarding the use of noninvasive testing to stratify asymptomatic patients with diabetes with regard to to coronary heart disease, ultimately coming up with the algorithm below. the data in DM suggest that routine screening with MPI of all asymptomatic patients is likely to have a low yield and have a limited effect on patient outcome. The yield of MPI can be improved by selecting a higher-risk group of patients with symptoms, peripheral vascular disease, CKD, an abnormal ECG, or a high CAC score (e.g., >400) (83,84). In such patients, intense medical therapy appears to retard progression of asymptomatic and symptomatic CAD (72). Whether coronary revascularization offers additive prognostic benefit to medical therapy when the ischemic burden exceeds any particular threshold is still unclear for the asymptomatic diabetic population. The argument for stress testing for high CAC rests on the assumption that identifying those individuals with significant ischemia due to tightly blocked coronary arteries can improve outcomes. This hypothesis has never been tested, let alone proven. It may seem logical that those asymptomatic individuals with high risk CAC scores >400 and ischemia would benefit from an invasive strategy with coronary angiography followed by either stenting or bypass surgery but it is entirely possible that such an invasive strategy could cause more harm than good. Harm comes from subjecting those individuals with abnormal stress tests to a potentially lethal procedure-cardiac catheterization. David Schade, an endocrinologist, has opined persuasively on the inadvisability of either stress testing or cardiology referral in those with high CACS. Schade’s algorithm for management of a high CAC specifically recommends against referral to a cardiologist or performance of a stress test. It emphasizes very intense management of risk factors with lifestyle changes and medical therapy with LDL goal <70. As a cardiologist with a strong interest in prevention of atherosclerosis I agree with many of Schade’s points. I do, however, believe that high risk patients can benefit from seeing a cardiologist who is very focused on prevention of atherosclotic complications rather than performing procedures. I don’t routinely recommend stress testing for my patients with high CAC but I have a low threshold for recommending stress testing in them based on worrisome symptoms, especially in those who are more sedentary or are diabetic. The skeptical cardiologist has gotten used to answering security questions when establishing online accounts. My answers to these questions are typically pretty obvious (to me) and easy to retrieve from my overwhelmed brain. I was baffled by almost all of these and gave up. Is there a Yelp for Medications and should you be using it? The skeptical cardiologist recently prescribed ezetimibe to a patient who was leery of taking statin drugs for her elevated cholesterol. In the past she had taken red yeast rice in the belief that this was a safe and natural way to lower her cholesterol. I told her that I had looked into and researched red yeast rice (and wrote about it here), and that it was neither safe nor effective. When I saw her back at our next office visit, she informed me that she had done her own research. She had gone on the internet and Googled ezetimibe and based on its “reviews” she felt it was an unsafe and dangerous drug. It occurred to me at that point that patients like Ms X may actually believe that they can get reliable information on drug side effects and efficacy by going to a website where patients leave reviews on drugs they have taken. Such sites would be the equivalent of Yelp, which the wife of the skeptical cardiologist utilizes extensively to determine which restaurants we should patronize. Lo and behold, if one Googles “reviews Zetia” a whole host of websites pop up offering you the opinions of random individuals on the drug. I hadRated Zetia for Rheumatoid Arthritis Report BEWARE. My husband took Zetia along with stantin, Crestor. Within a week, his leg muscles inflamed and shut down his kidneys and liver. He has been in the hospital for over a month and his condition has not improved. He’s on dialysis and can not walk. He is an alcoholic and his liver failed with Zetia. Low dose of Zetia ….After just first days had severe diarrhea, halfed the dose. After a month I started seeing flashes in my right eye. Lots of eye fatigue, now a lot of ‘floaters’ in my right eye. Got checked by eye doctor to make sure it wasn’t optical nerve damage. Scarey. Coincidence? Don’t think so. I empathize with and totally respect my patient’s desire to do her own independent research on the potential side effects of a drug that she will be putting in her body. However, the Yelp approach just does not work well for medications. There are three problems with relying on these kinds of patient-reported medication side effects. The first is that the patients who leave comments on these sites are not representative of the overall pool of patients receiving the drug. Patients who feel they have been harmed in some significant way are much more likely to be motivated to spend the time recording what happened to them than are the individuals who felt fine after taking the drug. There were 4 million prescriptions for ezetimibe written in 2015 and the number of patients leaving comments on these patient-review websites at most number in the hundreds. Thus, 99.9% of those taking ezetimibe are being silent, most likely because they are doing fine with the drug. Secondly, most of the side effects reported by patients after taking ezetimibe occur at about the same frequency in those who take a placebo. Although the package insert for ezetimibe lists various “common” side effects of the drug (such as diarrhea and upper respiratory infection), this table from the same package insert shows that such ailments are about as common in the group taking placebo. The manufacturer, following FDA guidelines, reports out adverse reactions that are more common than 2% and numerically greater than placebo, but these are not necessarily significant differences. Thus, we see that 4.1% of patients taking Zetia had diarrhea, but also that 3.7% of patients taking placebo had diarrhea. If you take any group of several thousand individuals and follow them for a couple of months, probably 4% will get diarrhea whether or not they are taking ezetimibe. Finally, we have to take into account the nocebo effect. The opposite of the placebo effect, in which inert substances make patients feel better, the nocebo effect makes patients who believe a drug will have side effects much more likely to experience those side effects. The nocebo effect is quite common in patients who have read very negative comments on the internet about statin side effects. It is clear to me that this statin-related nocebo effect has also influenced patients taking non-statin cholesterol lowering medications like ezetimibe. This is such an important factor in how patient’s tolerate ezetimibe that I spend considerable time during office visits emphasizing that ezetimibe works in a totally different way than statins, and is not associated with muscle aches/myalgias. Alas, my patient has chosen to rely on the Yelp approach to deciding which medications to take. I’ve given her the best information I could on the safety and efficacy of ezetimibe based on my years of prescribing it and studying it. At this point it is her decision to make, and I accept it and we move forward managing her cardiovascular disease with the other tools in my toolkit. Unlike an inaccurate restaurant review, however, a single individual describing inaccurately horrific side effects of a medication has the potential to steer thousands of patients away from potentially life-saving therapy. In a previous post the skeptical cardiologist wrote about the reluctance of doctors to “heed the call” , i.e., to respond to an in-flight medical emergency (IME) when the flight crew requests assistance from qualified medical professionals. Only 20% of physicians in my (very unscientific) poll would respond to such requests. but I and other physicians had concerns beyond medical liability, as I detailed in my post. At the time I wrote that piece, to be honest, I was in the camp of physicians who would prefer not to heed the call. Although Winocour was correct that the vast majority of in-flight medical “emergencies” resolve without any specific intervention it is still helpful for a physician to attend on such patients and assess the situation. And it is true that if he had attended on a patient with a serious non-transient medical problem he would suddenly find himself having to make an incredibly difficult and life-deciding decision on whether or not to divert the plane or make an emergency landing with insufficient diagnostic tools and inadequate information. But somebody has to make that call and the physician heeding the call will have the assistance of experts in the field on the ground. Qualified Physicians Should Be Prepared To Heed The Call! After pondering the issue for a few years and reading an excellent review on the topic in a recent JAMA I have changed my stance and am now completely ready (almost eager) to heed the call. 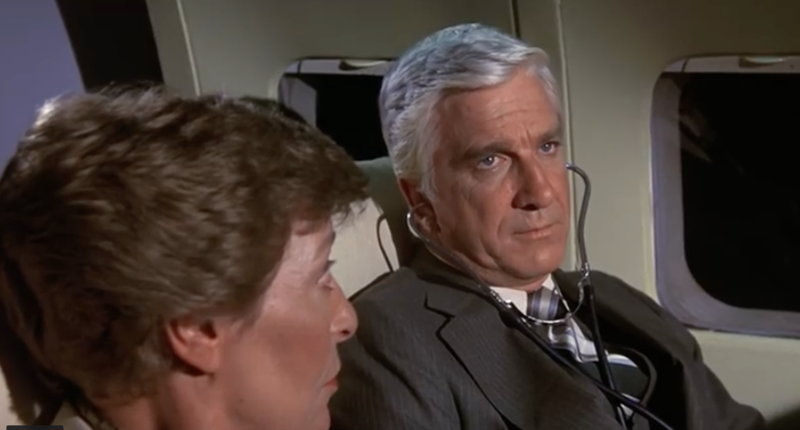 Leslie Nielsen as Dr. Rumack in Airplane! He heeded the call. Qardioarm BP cuff-Rapid, efficient assessment of BP without tubes, or wires. Stethoscope-a good one with which I can hear heart murmurs and lung sounds. Although the FAA-mandated emergency medical kit on board should have both a BP cuff and a stethoscope , I have no confidence they will be either accurate or functional. Sublingual nitroglycerin. The kit on the plane should have these along with 325 mg aspirin tablets, IV atropine, and injectable glucose, epinephrine and lidocaine. An epinephrine auto-injector. For the stricken passenger who is suffering anaphylaxis from the mixed nuts being served across the aisle. Should there actually be a cardiac arrest I’m completely up to date on Advanced Cardiac Life Support (ACLS) and CPR training and there should be an AED on board to defibrillate if appropriate. I’ve also decided that despite my reluctance to bring attention to myself, it is highly likely that I will be the most qualified person to rapidly diagnose and treat any serious cardiovascular condition that arises on my flight. As a doctor, I believe, I should be striving to provide assistance to those suffering whenever and wherever I can, be that in the air, on the sea, in the hospital or in the office. N.B. One (of many) of the newly-minted wife’s favorite Airplane! lines comes from the doctor who heeded the call. Rumack : You’d better tell the Captain we’ve got to land as soon as we can. This woman has to be gotten to a hospital. Elaine Dickinson : A hospital? What is it? Rumack : It’s a big building with patients, but that’s not important right now. In researching the whole subject of grapefruit-drug interactions I came across a fascinating intellectual battle between David Bailey, the researcher who first identified a significant grapefruit-drug interaction, and clinicians and researchers, some of whom are supported by the Florida Citrus Board, who feel this interaction is not significant. What Does The Internet Tell Us? The first item is an ad from the company that makes Eliquis which takes you to their patient-oriented Eliquis site and immediately presents you with important patient safety information. Nowhere on the site is the word grapefruit listed (as of July, 2018). The second item is what Google calls a snippet and which they will present to you as what they think is the best answer to your Google search question. In this case the snippet (and the first 4 hits) is lifted from Web MD an absolutely unreliable source of information (see my post on entitled Web Md:Purveyor of bad health information and snake oil) but one which Google (and thus millions of unsuspecting Googlers) relies on for answers to medical questions . Web MD advises you to avoid grapefruit if you’re taking eliquis. Close inspection of the WebMD article proffering this advice reveals the sole reference that actually bears on this topic: (Bailey et al , 2012 , CMAJ). The main author of this paper (which has the oddly phrased title Grapefruit–medication interactions: Forbidden fruit or avoidable consequences? ) is David Bailey. David Bailey may be better known as the first Canadian to run a mile in under 4 minutes. His Wikipedia entry spends equal time on his running career and on his major claim to fame: grapefruit drug interactions (GDI). Bailey serendipitously discovered that grapefruit increased levels of the antihypertensive drug felodipine in his own body in 1987, information which was pretty much ignored until he published a research paper in the Lancet in 1991 showing a doubling of felodipine levels in 6 volunteers who consumed grapefruit. Since then studies have shown that grapefruit juice acts by reducing presystemic felodipine metabolism through selective post-translational down regulation of cytochrome P450 3A4 (CYP3A4) expression in the intestinal wall. Bailey has taken the grapefruit (and Seville orange) ball and run with it. His publications emphasize the broad scope and potential dangers of multiple grapefruit-drug interactions. A 2012 Bailey paper lists 85 drugs with the potential to interact with grapefruit juice including, you guessed it, apixaban. Despite these potential interactions the actual number of clinically significant interactions or harm reported is minuscule. This has not deterred Bailey from emphasizing the importance of the interaction he discovered. Articles, like the NY Times article typically buy into Bailey’s fear-mongering and spend multiple paragraphs describing a single case report suggesting that ingestion of grapefruit juice was responsible for a dangerous interaction but such cases are rare and strong evidence that grapefruit juice was responsible is not present. What Can We Learn From The Florida Department of Citrus? We know of no validated evidence that coadministration of grapefruit juice with a drug has caused a dangerous interaction, resulting in serious adverse effects or actual harm to a patient’s health. We point readers to 2 extensive review articles on grapefruit juice–drug interactions that have appeared in peer-reviewed medical literature.2,3 These articles provide a review of primary research literature, a compilation of the extent of interactions with specific drugs, and an evaluation of their clinical importance; however, neither of these publications is cited in the CMAJ article. Whereas David Bailey has a bias to promote and exaggerate an interaction that is his claim to scientific fame most of the research and reviews that counter his claims come from researchers who are likely heavily biased to minimize the importance of the interaction: they are funded by the Florida Department of Citrus. Are We Missing Important Grapefruit Medication Interactions? In our experience, and in that of our experienced colleagues, we have yet to come across clinically meaningful interactions of drugs and GFJ. This is despite our day to day experience of managing patients on statins, calcium channel antagonists, anti-platelet agents and anti-arrhythmics, which covers over 10,000 patients in the last 10 years alone. Likewise, there is little formal evidence of an impact, even from large scale clinical trials, with adjudicated and well documented endpoints. When consumed in usual dietary volumes, grapefruit juice is considered a moderate inhibitor of CYP3A4. Therefore a dose adjustment of apixaban is not expected to be required. I was reminded of the grapefruit-drug interaction in the last few weeks as several of my patients have started using CBD oil for various problems and have asked if it is safe to use with their cardiac medications. CBD interacts with other medications in your body in the same way as grapefruit, only even stronger. However, the site that CBD school references (Project CBD) is not that definitive about grapefruit-drug interactions being a guide to CBD-grapefruit interactions. The drug-drug interactions between cannabinoids and various drugs at the CYP level are reported, but their clinical relevance remains unclear. Which sounds very similar to where we are at with grapefruit-drug interactions in general. I had my patient perform an experiment to see if the grapefruit actually caused her nose bleed. She repeated her consumption of large amounts of grapefruit and had no nosebleed this time. Are Your Palpitations Due to Benign PVCs? What Cold Medications Are Safe For My Heart? What Does The Death of Robert Atkins Tell Us About the Atkins Diet?